PARSIPPANY, N.J., Jan. 10, 2017 /PRNewswire/ -- The maker of Bear Creek® soup mixes, Bear Creek Country Kitchens, is serving soup lovers a chance to win a week-long, rustic getaway for four to the Rocky Mountains. The Great Bear Creek Getaway sweepstakes, which begins January 10, 2017, will award one lucky winner and three guests a seven-night stay at a family resort in Estes Park, Colorado. No purchase is necessary. For a complete listing of official contest rules and for more information, please visit www.BearCreekGetaway.com. a three-month supply of Bear Creek soup mixes. Ten secondary prize winners will also be chosen. Each will win a Bear Creek prize basket valued at $565. The prize basket includes a $100 cash card and soup service items, including a soup bowl and spoon set for four, a four-quart stockpot and cover, soup tureen and ladle, cloth napkins, pot holder, insulated soup container, picnic basket and three-month supply of Bear Creek soup mixes. "For our soup lovers, Bear Creek Country Kitchens is a cozy place. We work hard to put the feeling of comfort and simplicity in every Bear Creek soup mix we make. It's this place of contentment the Great Bear Creek Getaway celebrates which is why it is perfect for us to host a great getaway that serves up family comfort as the grand prize," said Matt Frampton, Brand Marketing Manager for Bear Creek Country Kitchens. River Stone Resort and Bear Paw Suites is a popular family destination built on the Fall River in Estes Park. The beautiful riverfront condos are equipped with everything families need to make their trip to the Rocky Mountains memorable and as comfortable as possible. Home to wildlife including elk and bears, plus miles of trails, the area is known for a popular hiking trail around Bear Lake that offers stunning mountain peak views. Bear Creek Country Kitchens is also featuring a complementary playlist on its sweepstakes website. The curated playlist features 10 relaxing songs by different artists. Tracks include ambient nature sounds and tranquil tunes. Enter for a chance to win by visiting www.BearCreekGetaway.com and follow the on-screen directions to complete and submit an official entry. Contestants can enter once daily through March 31. No purchase is necessary. A purchase will not increase anyone's chance of winning. Legal residents of the 50 U.S. states and the District of Columbia who are 21 years of age or older are eligible to participate. Winners will be notified by mid-April. Bear Creek hearty, dry soup mixes offer the opportunity to bring home a little comfort this soup season. While they simmer on the stove, you can smell the hearty goodness. They're quick and easy to make and come in 15 delicious variations, including such favorites as Cheddar Broccoli and Creamy Potato. These soup mixes have a homemade taste that will satisfy every appetite, using only the highest quality ingredients and a special blend of spices. So simple to prepare yet so hearty and satisfying, Bear Creek soup mixes create the perfect meal occasion for the whole family. Enjoy them as is, or make them your own by adding your favorite fresh vegetables or grilled meats. 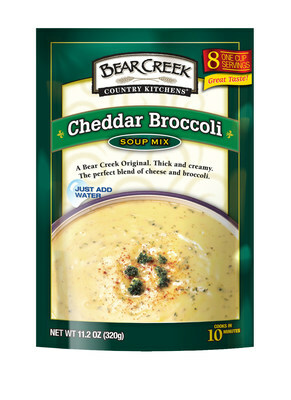 Bear Creek soup mixes are available in family size bags or convenient "to-go" bowls. Bear Creek Country Kitchens also offers savory pasta mixes, hearty rice mixes and macaroni & cheese. Learn more by visiting the Bear Creek Country Kitchens website at www.bearcreekcountrykitchens.com or Facebook page at www.facebook.com/bearcreekfoods. B&G Foods, Inc. (NYSE: BGS) and its subsidiaries manufacture, sell and distribute a diversified portfolio of high-quality, branded shelf-stable and frozen foods across the United States, Canada and Puerto Rico. Based in Parsippany, New Jersey, B&G Foods' products are marketed under many recognized brands, including Ac'cent, B&G, B&M, Baker's Joy, Bear Creek Country Kitchens, Brer Rabbit, Canoleo, Cary's, Cream of Rice, Cream of Wheat, Devonsheer, Durkee, Don Pepino, Emeril's, Grandma's Molasses, Green Giant, JJ Flats, Joan of Arc, Las Palmas, Le Sueur, MacDonald's, Mama Mary's, Maple Grove Farms, Molly McButter, Mrs. Dash, New York Flatbreads, New York Style, Old London, Original Tings, Ortega, Pirate's Booty, Polaner, Red Devil, Regina, Sa-són, Sclafani, Smart Puffs, Spice Islands, Spring Tree, Sugar Twin, Tone's, Trappey's, TrueNorth, Underwood, Vermont Maid, Weber and Wright's. B&G Foods also sells and distributes Static Guard, a household product brand. For more information, please visit www.bgfoods.com.